This black and white photograph documents a bridge on Vermont Route 15 in Jericho. A road crosses over a bridge in the image midground. The bridge and road approach are lined with guard rails. A truck travels over the bridge toward the viewer. 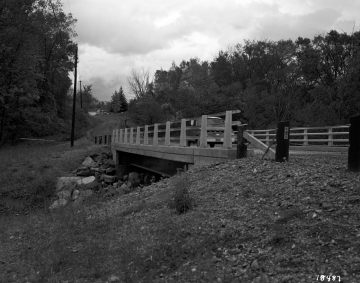 The bridge crosses over a gully. Utility poles follow the left side of the road. There are conifers and deciduous trees to left and right of the road in the image background. The season is autumn. Completed / Essex, Jericho, Belvidere Bridges See 17499-511, Also 17744-78. Jericho TF 6613 TH.